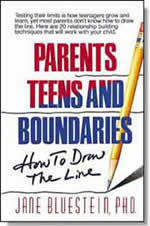 How you set boundaries with your teens is among the most important aspects of your parent-child relationship. Unfortunately, this ability does not come automatically with parenthood. Here Jane Bluestein, a former teacher and counselor, looks at 20 relationship-building techniques all parents can use to set limits with their teens. You'll learn the essential arts of loving, motivating, accepting, negotiating, respecting, acknowledging, communicating, supporting, empowering, trusting . . . and much more. These practical strategies for boundary setting will enable you to avoid conflict, resolve problems and establish a foundation of mutual love and respect. As a result of learning to set healthy boundaries, you may actually begin to enjoy your children's teen years!